Behind-the-scenes: The 5 books you MUST read if you are a creative person. Here is a list of "must read" books for creatives and entrepreneurs! My favorite books listed here include stories of women CEOs, one-woman operations and businesses and people following their dreams and helping to make the world a better place in the process. Enjoy! 1. "In the Company of Women by Grace Bonney". I have loved reading Design*Sponge for as long as I can remember and LOVED reading this book, which highlights 100 creatives in an interview-style format. It's breathtakingly honest and raw, beautifully written and formatted, and gorgeous to stare at all day long. My little daughter loves it and asks me to read it to her, too, so it's basically just the best book ever written. Just trust me, you need to own this book. 2. "The Life-Changing Magic of Tidying Up" by Marie Kondo. This book puts a lot of things in perspective. You don't have to be an organizational freak to read it, either (I'm a little disorganized!). It just helped me to realize that what I own should bring me joy and what I am holding onto may not have value. It's a wonderful book and it's an amazing reminder. In a crazy world, it's important to stop and take the time to put perspective back into our lives and this book does just that! 3. "You are a Badass" by Jen Sincero. If you hate inspirational or self-help books, this one is for you. There's ABSOLUTELY no fluff here, and its why I love this author so much. Jen Sincero gives actionable, brave and courageous, and hilarious perspective in this book. I love it and I appreciated how it focuses so heavily on gratitude as a key to happiness. I also love that she says bad words and does irreverant things. Because that's just so important, too. 4. "The Creative Habit" by Twyla Tharp. I have read and re-read this one countless times. I love to read about the habits that other creatives develop to give themselves structure to be creative. Freedom, walks, naps and cocktails are featured, so it's basically the book I live by. Read it! And re-read it every year for good measure. And then highlight it. I need someone out there to tell me to do things in order because otherwise my creative side takes over and I go wild. I love drinking coffee every morning and need validation. I love naps and I need to know that important people throughout history also appreciated the "siesta". I am secretly (or publically?!) really nosey and love knowing what people do all day with their lives. So, my only remaining thought is, what is your favorite book? Comment below! A little round-up of my favorite Art and Business Books! "Think Like an Artist" by Will Gompertz, is my new favorite book! It breaks down the qualities of artists and is delightfully refreshing if you are encountering a little summer slump or total burnout. The author focuses a great deal on the personality traits that set entrepreneurs and artists apart, which is really interesting to read about if you are currently pursuing an art-related passion or dream. One of my favorite parts about his writing are all of the annecdotes about artists throughout history and the tales of their funny personalities. It's awesome, check it out! "Creative Block" by Danielle Krysa. Anyone who knows me knows what a HUGE (Crazy?) fan I am of The Jealous Curator. I find her voice (podcast, too!) to be so honest, refreshing, and kind in a world of competitive and crazy. Her books is nothing short of magical and I love it. I have re-read it a couple of times now and every time I want to put it down, I cannot. She profiles many artists and their stories and the writing is fresh and real. I LOVE THIS BOOK. "Chasing Slow" by Erin Loechner. In a time of MORE, MORE, MORE, this book is amazing. It reminded me to slow down even though I want to fight really hard to achieve my dreams. Erin Loechner is one of my favorite bloggers and has always written from such an interesting perspective that makes you really think about what matters in life. I highly recommend this book for not just art or business, but for a reality check on life, too. "The Promise of a Pencil" by Adam Braun. If you know me, you know I love the organization Pencils of Promise. We partnered with them for the Rise Summit and have raised money to build a school soon! I love the mission of this organization and the slow, thoughtful approach they take to building community. In his book, the Founder Adam Braun tells his life story in relation to the forming of PoP and it's so compelling. It makes me want to pack a bag and go build schools immediately! But more importantly, Braun celebrates those people who are forging their own paths to build a life and career that they are proud of. Go check this book out. Ok, what are your favorite books for inspiration and business ideas? Be sure to share in the comments below! The 14 in 2014 online book club has returned in 2014! Our first pick is "Where'd You Go Bernadette" by Maria Semple. I loved this book, immediately upon beginning. Turns out that the author worked in writing sitcoms in her past and this book reads just like that; fast-paced, hilarious, touching and addictive! And the hilarious, snarky email banter between characters Soon-Lin and Audrey had me in stitches. (note: this book club is so effective, because of the awesome ladies in it! I have been trying to do this kind of thing for years and never actually did it. Read more about that here. I never read any of those books listed...so sad!) Join us on Facebook! Read more here about what the NYtimes had to say about this awesome book pick for our club. Also, how adorable is Bee, the main character? She is one of my favorite leading ladies for her curiosity, uniqueness and ability to stand apart from her granola-eating, Seattle, prep-school buddies. Bee's parents Bernadette and Elgin are so wonderfully flawed and real that a real parent like myself cannot help but love them. And the end of the novel, well...gasp! I loved that too! What did you guys think? Join us for February's book "Wild" by Cheryl Strayed. "The Light Between Oceans", Mindy Kaling's hilarious memoir, Gone Girl, Flight Behavior, Sweet Tooth, The Normal Bar, The Guernsey Literary and Potato Peel Society, And the Mountains Echoed. I am reforming the way that I look at New Years Resolutions this year and making a list of achievable goals instead. After all, no one really wants to start something so radical in the new year, only to be disappointed. Here are my 6 achievable goals for 2014. A person I hope to be more like... I am still pondering this one, it's a tricky one! A good deed I'm going to do... I am going to try and do a selfless act or random act of kindness once a week for the year of 2014. I won't be sharing them with anyone, just trying to change the way I see the world through small deeds. A place I'd like to visit... I am dying to return to Spain, but would love to visit any new place as I am a total "wanderluster". Also, I would love to see Nashville, Phoenix or Savannah. A book I'd like to read... This one is EASY, because we have a super awesome ART by MEGAN book club that anyone can join! It's based right here on the blog and on facebook, be sure to check it out for the 14 in 2014 edition. Guest post written by Kate. "I thoroughly enjoyed Mindy Kaling's first book, Is Everyone Hanging Out Without Me? As I read the book, I heard her voice in my head for each and every word. All last year Hulu kept recommending her show to me, and I kept thinking, "I know I am going to love but I really just don't have the time now Hulu!" When all season finales were over for the year in May, I gave in and watched the entire Mindy Project in two days. Similarly, I devoured the book in 72 hours or less. Mindy has a knack for writing, and like her role model Tina Fey, is hilarious and wise at the same time. The book actually reminded me of Tina's Bossypants a lot. It is always interesting to learn how people go from awkward teenagers to Hollywood actors and writers. It is also so refreshing to hear someone talk about mistakes and immature office shenanigans without sugar coating it. Everyone makes mistakes, maybe not everyone has a chance to storm out of a writers meeting and throw a hissy fit, but not everyone gets to work with Steve Carrell either. My only complaint was this- it was too short! I can't wait to read more of her writing in the future." 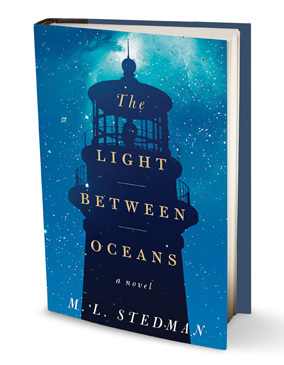 July's Book Club Book: "The Light Between Oceans"
So, did everyone finish reading "The Light Between Oceans" and have a little time to recover? All I have to say is that our August book ("The Secret Keeper") better be happier! I knew I was done for as soon as I met the main characters, Izzy (really!??) and Tom. However, despite the UBER depressing story of love, lies, deception and parenting, I truly liked this tale. The details about Australia were compelling, the narration about life as a lighthouse keeper was interesting, the tale of baby Lucy was heart-wrenching and I could not put the book down. However, I was literally sobbing at the end. I was snorting-alone-on-the-couch-style crying. A bit intense! I especially loved the tender moments between Tom and Lucy and the description of their beautiful connection. Also, I loved to see how the resolution of the tale worked out. Don't worry, I won't spoil any more! What did you think? Also, how beautiful was the cover art? June's Book Club pick was "And the Mountains Echoed" by Khaled Hosseini, author of "The Kite Runner" and "A Thousand Splendid Suns". The book was set in Afghanistan, just as his others were, and told the tragic tale of the interwoven lives of several people living in the transitional years before, during and after the Taliban in Afghanistan. The story was EXTREMELY sad, the book club was a little up in arms about reading such a depressing book (sorry girls! ), but Hosseini writes so poignantly and with such talent, that the terrible tale of others disaster and misfortune is still a compelling tale. We all cried, right? I hope so. I always enjoy a story that has the "Crash movie effect". In other words, everyone's lives are interconnected and woven in such a complicated and interrelated plot. In the end, the sad tales of one's life are related so closely to the plot of another and it is so very intriguing to me at least! Join our book club here: 13 in 2013 on Facebook. May's Book Club Book: "The Normal Bar"
I'll be the first to admit, that I was very skeptical when Jessie picked this month's book. I fear the self-help section of the library and often get giggly and immature about relationship books in general. However, "The Normal Bar" surprised me with its practical advice, interesting statistics and constructive, interesting ideas for increasing "normal" in relationships. What I found most interesting is that the advice that was intended for couples can be used in all relationships, including those at work. In my high school Spanish classroom, I deal with a variety of personalities with an even more vast variety of backgrounds. At times this can be frustrating but with new, refreshed eyes, one can see that all that needs to be done is to "establish a new normal" as this book suggests. With a standard of behavior, people (students) can learn how to accept their surroundings and work to achieve the standard set by that adult. It's all so intriguing! What did you think, "book clubbers"? Also, I loved the Book Club questions provided by the Normal Bar site and thought that I would share the answers to some of my favorite questions with you to get the discussion rolling. Do you believe friends make good life partners and lovers? ABSOLUTELY! I love my best friend. Do you think sharing the same religious and/or political views really make or break a relationship? I do not think that this is as important as similar life-perspectives. When people are of different religious backgrounds, they may still share the same perspective on issues that they consider important. Also, spiritual feelings can be very different between people of the same religion *I have seen this a lot among Catholics!. Political views are a little trickier in my opinion because people LOVE to talk about politics at dinner, parties, happy hours, etc. Sometimes its fun to debate, but both parties have to be interested in the debate (and debate fairly!) or it can kill a relationship, in my opinion. Does money buy relationship happiness? Nope. I sure hope not! Do you believe it is OK to keep financial information from your partner? I do not. But, I am not sure that this is part of establishing the "normal bar" in each person's relationship. What is the most fulfilling aspect of your relationship? I love having a smiling person come home each day and seeing the reaction on my two year olds face. I love having someone who consistently supports, believes in me, encourages me and challenges me. The (other) most fulfilling thing is having a best friend who I also have a crush on, still...after a long, long time! "Gone Girl" rocked my scaredy-cat socks off! Almost every single "twenty-something" that I have asked has said something along the lines of "I couldn't put it down" or "wow, it was addictive" in regards to this dysfunctional marriage murder thriller. Read more here about what the New York Times has to say about it. What do you think, fellow "book clubbers"? And anyone else who has read it?! I'm going to have to admit to you Book Club ladies, that I cannot, for the life of me, get through Flight Behavior! I think the details about the butterflies are super interesting but I am getting lost in all of the description. I will keep trying, promise! I tried to read "Poisonwood Bible" last summer and had the same experience. I remember liking the characters and the idea of the book, but struggling with all of the details. Barbara Kingsolver, help me out! What do you ladies think!? Here's the NY Times review, if you'd like to take a look. Ok book clubbers, what did you think of our February pick by Kate? 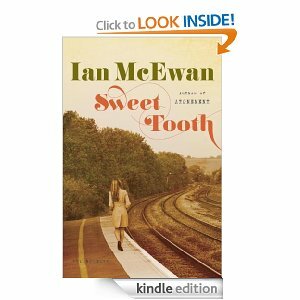 "Sweet Tooth" by Ian McEwan was a good read that got EXCELLENT at the end. Just in time, because I was a little bored and distracted during the middle, but I am easily distracted. What did you gals think? I loved the ending so much!!!! Next month's book is entitled "Flight Behavior" by Barbara Kingsolver (thanks Helen!). What did you think of our first read? Tell me here in the comments section!! I loved the "Potato Peel Pie Society" so much I am sure I will read it again someday! The best part of the book to me was the character development. I felt, while reading, like I had a whole new set of friends in Scotland. Also, the style of the writing was so easy to read. I loved reading the letters back and forth because it didn't feel like a chore to complete a chapter if I was tired of reading, I could just finish a letter and be done. That being said, I could not put the book down!!!! I just Loved it! 5/5 stars! I just finished one of the best books I have read in a long while. I cried. It was so darn good.The best part is that I get to teach it this school year! Julia Alvarez is an amazing author and I could devour anything she writes. Her stories come alive so much that you become convinced that you are a part of the families in her tales. In "Before We Were Free", Alvarez tells the tale of a young girl during the dictatorship in the Dominican Republic in the 1960s. The story is told from Anita's 12-year-old perspective and is absolutely enchanting. I felt like I was 12 again with a crush on a boy, worrying about what to say in school and dealing with my family. She weaves into Anita's story the history of a dictatorship, where Trujillo stayed in power for 31 years and left an indelible mark on the Dominican people. This book is fantastic and I 100% recommend it to "Spanish junkies" or "bookworms" alike. I am absolutely loving this post from whowhatwear.com's blog today celebrating all things great about Spanish fashion fused with the idea of inspiration by the children's book classic "The Story of Ferdinand" by Munro Leaf. This book was one of my favorites and my little one is also starting to love it! Its just so cute to read about this little pacifist bull and his misadventures. Plus, its a great tool for teaching Spanish in the past tense. Ay, Ferdinando!! I just stumbled upon a new and different type of blog. Lord know's there are a whole lot of us mama bloggers out there, all sharing our stories and adventures. However, I had yet to find a Dad doing the same. Search no more....Spain Dad exists. It is very intriguing to read the stories that so many women write about from a man's perspective. Very cool! And he has written a book including the various perspective of young Dad's also trying to make it all work. Plus, this blog reaches my inner "Spainophile" and I can read it as a guilty pleasure, pretending to be in Madrid while just seated at my little MacBook. Yesterday, I was listening to NPR and heard about a new and fascinating book written by an Muslim-American author and his experiences growing up in Minnesota. The book is entitled "American Dervish" and profiles a young, Pakistani born boy who lives as the extreme minority in suburban Minnesota prior to 9/11. Adding it to my "list of books to read in 2012". Have you heard of any other new books that I should add? I really enjoyed reading "Sightseeing" by young Thai author Rattawut Lapcharoensap. It is a collection of short stories about daily life in Thailand and offers the unique perspective of a young author. I truly enjoyed the perspective of a young person and also loved reading about a place as unique as Thailand. Also, on a more personal note - short stories are the wave of the future for busy moms! In my daily surf of the web, I have reminded myself that I love these books found on Amazon. What a cute way to teach little ones about different foods around the world? It would be great to read the book together and then have a fun "themed" dinner as a family!